3rd May - Walk will now be Furzton Brook - Car Park opposite The Bowl. 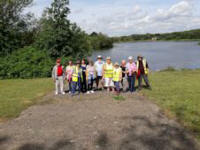 Milton Keynes Friday Walks are part of a National Scheme called Walking for Health. It began with 5 people on 15th February, 2008 , and has now grown with an average attendance of 35. Walks were chosen with points of interest - now we cover an extensive area, but still stop occasionally to admire points of interest. We aim to do three walks enabling the less able to enjoy our countryside as well as seasoned walkers. We endeavour to add social events throughout the year. We are a roaming walk, meaning we walk from a different place in Milton Keynes every week. Refer to our current for details of meeting places. Schedule April to June. Note change for 3rd May. See above. We start walking at 10.15. But before we set off we need everyone to register for that walk, and to have completed an anonymous Health survey. If you would like to complete the questionnaire at home in advance please click here to download a copy. We always organise a meeting place at the end of the walks where we can have a coffee or tea and socialise for a while. No special footwear is needed, but comfortable flat closed-in shoes are recommended. Leaders may download a register, risk assessment sample risk assessment and accident form here. SHORT 35 - 40 minutes At a slowish pace, suitable for those suffering from arthritis or those unable to walk far.